Providing the best locomotives for every operation. 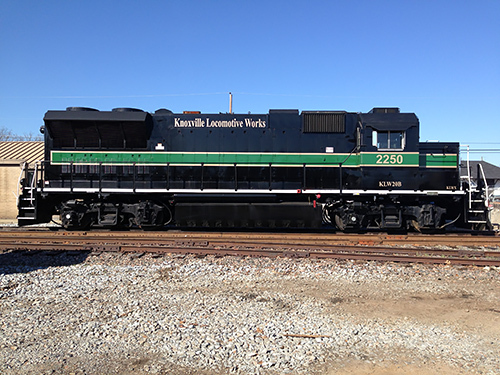 Knoxville Locomotive Works (KLW) has repowered, refurbished, remanufactured, and/or upgraded over 400 locomotives since its establishment in 1998. Today, KLW offers its own line of green, single-engine, repowered locomotives from 1,000 hp four axle switchers up to 3,200 hp six axle line haul locomotives. In addition to green locomotives, KLW also offers locomotive rebuilding and refurbishment services for traditional locomotives. KLW is the only manufacturer using a high-speed engine with a low-speed AR10 alternator. Click here to see how our design is different from the rest. KLW's line of single-engine green locomotives offer low emissions, low fuel consumption, and superior tractive effort performance. Learn more here! One of the key components in our locomotives is the MTU engine. Learn more about the four different MTU engines we use right here. The KLW SE32C is a 3,200 bhp six-axle locomotive designed for the most demanding operations. Click here to learn more. The KLW SE24B is a 2,400 bhp four-axle locomotive designed for medium size operations. Click here to learn more. The KLW SE15B & SE10B are four-axle switcher locomotives designed for smaller operations. Click the here to learn more. Established in 1998, KLW has worked on over 400 locomotives, ranging from small switchers to high horsepower line haul units, and now manufactures its own line of green locomotives. Click here to learn more. KLW is an evolving company and is quickly becoming the preferred green locomotive solution. Find out the latest news regarding KLW and see how we are changing the way people think about green locomotives. Looking to repower your aging locomotive? Want to submit your resume for employment with KLW? Visit our contact us page to find the right person to talk to.